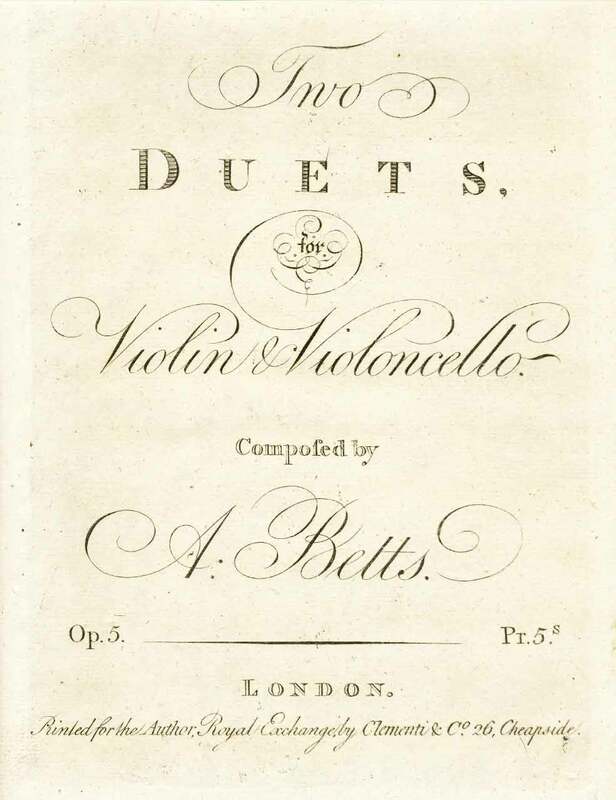 Betts: Two Duetts for Violin and Cello, Op. 5, No. 1 in C Major and No. 2 in E-flat Major. Facsimile of edition ca. 1810 (parts only) and modern performing edition, score and parts. Arthur Betts (1775-1846/7) was a violin maker, violin dealer and composer. His 3 Duos Concertante for 2 Cellos, Op. 12, were published by Grancino in 1982. These Duets of Opus 5 were published about 1810 in London. Duet No. 1 in C Major has a slow introduction in C Minor to a sonata form first movement in C Major. A second movement in F Major is marked Adagio con Espressione and the Finale is marked Rondo, Allegretto; rhythmically it is a Polonaise. Duet No. 2 in E-flat Major has a slow introduction to a sonata form first movement. The second movement is marked Rondo, Allegretto. There is no slow movement.